“Well, this is what I made. You can choose to not eat it, but you need to stay at the table”, as I try to respond calmly but the truth is, the whining makes me intensely frustrated and angry on the inside. This is a frequent short conversation at our house. Ethan, having sensory issues that results in him to be an extremely picky eater, will then sit at the table with an unpleasant look on his face. He often then follows up by pushing the plate away from him and saying, “It smells bad.” Let me just say, it doesn’t make the mealtime all that delightful. In all honesty, my boys are typically joyful and complain very little, but when it comes to meal times, it seems to happen a lot. I understand the whole sensory thing and we tried sensory therapy for over a year to get past that but it was without much success. Still my efforts remain with the same goal in mind: not to force them to eat what is on the plate, but then to also not complain about what they are being served. Are you a complainer? If we are honest, we can all find ourselves complaining over the little annoyances of life or what we are dissatisfied with. I am not talking about simply stating an undesirable fact about life, we all have those, but complaining is all about the heart and attitude behind stating those facts. In the last week alone, I heard complaining about the weather, traffic, a spouse, busy schedules, how much something cost, a job, co-workers, the food that was prepared, and someone’s own child. The list can go on and on though, can’t it? I’m not about to point fingers. I’ll admit that the cold weather, feeling tired and the alarm going off in the mornings are grumblings that have come out of my mouth in this past week as well. I just want to take a moment to help us stand back and have an honest evaluation of what our complaining can do and ourselves. A little “food for thought” if you will. Maybe you find yourself in a season of life with your plate being full of things that stink. You don’t seem to find much that makes you happy and you just want to push it all away. You try complaining about it to whoever may listen, and there might be some loving and patient people out there who will stand there and tolerate what you have to say. And then there are those people who seem to compete about complaining regarding who has it worse. You know what I am talking about. As if that is going to accomplish anything! But to these people, it does seem to make them feel better if they can try to prove how their lives are worse off. However, if you stand back and observe, all you see is an unpleasant look across their face. I was recently reading in Numbers about the Israelites getting ready to finally enter the Promised Land. It was the land that God describes as “flowing with milk and honey.” Shortly before they were ready to enter in, they sent spies to explore and see what was in store for them. They indeed found that it was green and lush, full of trees covered in figs, dates, and nuts. It had big beautiful fruits, grapes and pomegranates, that they took back to show the people. However, amid the beauty, they also found it had large fortified cities and the people living there were just as big. Scary. Instantly, the people start complaining. Everyone joined in. They started to question God and completely lost their perspective of everything that He has supplied, the miracles performed, and what He brought them through for the past 40 years. This made God very angry. As a result of their complaining, being a just God, He withheld from them the very thing that they wanted…a life with a plate full of good things for them to enjoy. It has really got me thinking. What do you think the Lord is withholding from you each time you complain? Seriously, let’s stop and think about that for a moment. 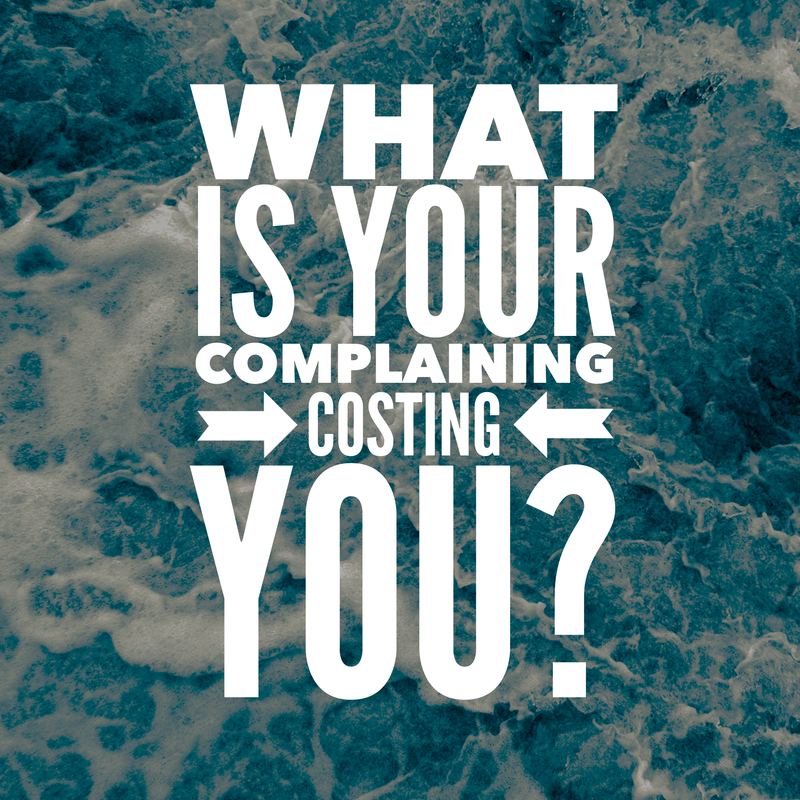 What is your complaining costing you? Joy? Peace? Contentment? Your reputation? Friendships? The very thing you desire? Each time we grumble, we are speaking against the Lord, and I think it often stems from ungratefulness, lack of trust, jealousy and pride. Each time we complain, we are typically thinking only of ourselves, right? We are not thinking about how God has been faithful and all that He has already supplied and given us. It can damage not only our relationship with God, but with others as well. Maybe your plate in life really isn’t great right now and it is full of distasteful things. You very well might be facing some big and scary events. It is OK to have emotions of sadness, discouragement, frustrations, and disappointment. However, it is what we do with those feelings that matter. What if we took them straight to God instead of those around us? Do not let your complaints cloud the light that could be shining through you! Rather than grumbling and whining, let’s respond with a heart focused on gratitude and truth. Instead of withholding His gifts, I believe having an attitude of gratitude will result with God rewarding us and blessing us in ways that are wonderful! Speak the language of the Lord – praise and thanksgiving. Let us not forget about all that He has already provided for us, the gifts of the past and also the ones currently in the present. Not only will having a genuinely grateful heart affect you and your situation, but it will affect everyone around you as well. Your light will be noticed. Guaranteed. How true (and I had to copy that graphic – it will probably show up on the screen during one of my sermons some day).